Hungary’s domestic automotive market and road haulage industry have stepped onto new ground with the introduction of Liquefied Natural Gas semi-trailers. DanubeTruck Hungary Kft, the national IVECO supplier, has delivered four LNG-powered units to Duvenbeck Logistics Ltd.
IVECO describes the moment as of historic importance for the long-term transport sector in Hungary when there is a growing demand for greener services worldwide, and IVECO’s advanced natural gas technology offers a mature alternative to diesel and provides a sustainable solution for our planet and businesses. “For the first time, we are setting up IVECO vehicles for our 140-truck fleet in Hungary, and for the entire Duvenbeck Group this is the first time we have LNG-powered tractors”, began Norbert Joichl, chairman and CEO of Eastern Europe at Duvenbeck Group. “These four tractor towing vehicles with semi-trailers will deliver automotive components between Austria and the Netherlands and Belgium via Germany, with a cargo weight of between 12 and 18 tonnes. In addition to good fuel consumption, there is a significant economic advantage that, in Germany, there is no need to pay tolls for LNG vehicles for two years now. This alone saves about 20 cents per kilometer, which is about 20 percent of operating costs. If LNG filling stations will be opened in Hungary, we will also set up our gas-powered vehicles for starting and arriving freight operations here”, said the CEO. “The four Stralis tractors are equipped with the largest LNG tanks available for Stralis models, with a capacity of 2×440 liters and a range of about 1,100 kilometers. These vehicles have been purchased with a system that, with their quiet, sophisticated gas engine, contributes to creating a comfortable working environment. We plan to operate tractors for five years, after which DanubeTruck Hungary Kft. will repurchase them. Also, IVECO-authorised workshops throughout Europe are prepared for the service of natural gas-powered trucks, so there will be no problem”, Joichl added. “We are delighted to welcome Duvenbeck Logistics Ltd’s pioneering and innovative purchasing decision, which was already made when the LNG-based truck tolls in Germany were not yet secure. Indeed, IVECO has had a vision since 1991 that LNG technology will once replace diesel. 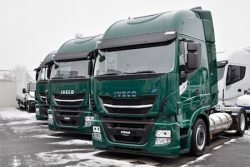 More and more fleets in Europe are seeing an increasing number of LNG-powered IVECO Stralis trucks and this technology has also begun to expand in Hungary”, said Zoltán Zákány, Managing Director of DanubeTruck Hungary Kft. The handover in Budapest was attended by a representative of the global energy supplier Shell. Shell, Europe’s fastest growing LNG filling network, is a pioneer in the field of LNG, which is due to its commitment to promoting the use of natural gas as a fuel for trucks.